LONACONING - Eugene C. Eagan, 68, of Midland,died Saturday in Sacred Heart Hospital. Born in Midland, he was a son of the late John A. and Agnes (O'Neil) Eagan. Mr. Eagan is survived by his widow, Mrs. Gertrude(Bradley) Eagan, a daughter, Mrs. Jo Ann Winner, Rockville; three sons. Eugene Eagan, California; Michael Eagan, Delaware and Patrick Eagan, Midland; four sisters, Mrs. Anna DeJoy, Luke: Mrs. Thelma Page, LaVale: Mrs. Norma Zimmerman and Mrs. Beatrice Tracey, both of Canton, Ohio; two brothers, John M. Eagan, Akron. Ohio and Edwin Eagan, Midland. Mr. Eagan was a retired service station operator and was a member of St. Joseph's Catholic Church and the Holy Name Society of the church. The rosary will be recited in the funeral home today at 7:30 p.m. and a Mass of the Christian burial will be celebrated in St. Joseph's Church today, at 10 a.m. Interment will be in St. Mary's Cemetery, Lonaconing. Killed on a Barton Tram Road. An accident happened at Barton yesterday by which James Eagan, a young boy about 15 years, lost his life. Eagan was sent to a store by his mother and on his return home attempted to board a train of mine cars. In this attempt he was unsuccessful as he fell between two of the cars, and was run over by them, his body being badly mangled. Mrs. Eagan has the heartfelt sympathy of the good people on this sad affliction. Mr. John Eagan died at his home in Midland last night at 8 o’clock from heart failure. He is a brother-in-law of Mrs. Judge Chambers, Mrs. Patrick Cosgrove, Miss Nellie and Mr. Bernard Hughes, of this place. Funeral arrangements have not been made yet. John (Jack) Eagan. 56, a native of Midland, died in Cleveland, Ohio, yesterday morning. He was the son of Charles Eagan, Midland, and the late Julia (Burns) Eagan. Mr. Eagan was a member of St. Joseph's Catholic Church at Midland and was a veteran of World War II. Surviving, in addition to his father, are a sister, Mrs. Esther Robinson, Frostburg; and a brother, Gary Eagan, Midland. The body is at the Eichhorn Funeral Home, Lonaconing, where friends will be received today from 7 to 9 p.m. and tomorrow from 2 to 4 p.m. 7 to 9 p.m. The rosary will be recited at the funeral home tomorrow at 7:30 p.m. Services will be held Tuesday at 9:30 a..m at St. Joseph's Church with Rev Joseph Fuller officiating. Interment will be in St. Michael's Cemetery. Frostburg. Midland Military Post will hold graveside military rites. Midland - Oct 26 - John A Eagan, 69, died yesterday morning at his home O'Mara Avenue. A life long resident of Midland, he was employed by the Celanese Corporation of America for eighteen years and was a member of St. Joseph's Catholic Church and the Holy Name Society. Surviving are three sons: John M. Eagan, Akron, O; Eugene M., Midland and Edward B. in the armed forces in Australia: four daughters: Mrs. Alvin Logsdon, Barton; Mrs. Joseph Zimmerman, Canton, O; Mrs. Clyde Page, Cumberland; and Beatrice R. Eagan, at home: two brothers, Edward Eagan, Philadelphia and Charles of Midland. EAGAN, John A, aged 69, died at his home on O'Mara Avenue, Midland, Sunday, October 25th. Requiem Mass Wednesday 9:30 A. M., St. Joseph's Catholic Church, Midland. Interment in the church cemetery. MIDLAND — A requiem mass for Mrs. Julia B. Eagan, wife of Charles Eagan, who died last Wednesday at her home, was celebrated Saturday at St. Joseph's Catholic Church. Rev. William McVeigh. officiated and interment was in the parish cemetery. Pallbearers were Edward Eagan, Thomas, Virgil and Alexander Burns, Timothy Cullen and Lester Reiber. Those attending included S Sgt. Charles G. Eagan, USMC, Camp Pendelton, Calif.; Mrs. J. Joseph Winner, Brownsville, Pa.; Garrett and Alex Burns, Miss Florence Anne Burns, Mr. and Mrs. Lawrence Rico and daughter, Lorraine, and Thomas Burns, all of Uniontown, Pa.; Mr. and Mrs. Alex Burns, Cleveland; Mr. and Mrs. John Eagan, Akron; Miss Rose Palmer, Mr. and Mrs. James Kenny and daughter, Eileen; Mrs. John B. Ross and Mrs. and Melvin Eiben all of Pittsburgh; Mrs. John Eagan and John Eagan Jr., Philadelphia; Mr. and Mrs. Francis Upperman, Reading, Pa.; Mrs. Virgil Bums and Miss Sarah Kenny, Cumberland; Mrs. John Bryson, Cresaptown. and Mrs. Margaret O'Rourke, Westernport. A terrible accident occurred last Tuesday morning, a few miles above Keyser, in which three men lost their lives and one is lying in a critical condition. The dead are D. W. Eagle, a well known business man, a farmer, a sawmill man and interested in many other enterprises around here; John Smith, aged 20 years; and John Gray. The injured man is Jos Boyce, who has a leg and arm broken and hurt about the back, and it is feared that he too, will die. Mr. Eagle's son was also with the men, but escaped injury. The men were starting an old saw mill that had not been run for some time. In some way the boiler exploded. Smith was killed outright, Mr. Eagle died just as they reached the hospital with him, and Gray died the next morning. Eagle was crushed about the head and chest. Two other men were standing near, but both escaped without injury. Olin, Mr. Eagle's oldest son, was standing within a few feet of his father. Alex Shears, the fireman, who escaped, says there was only forty pounds of steam in the boiler at the time. They were all standing together watching one man lace a belt at the time. The men were all buried at the Duling church, Smith Wednesday, Gray Friday morning and Eagle yesterday afternoon. Mr. Eagle was a member of the New Creek Council National Union, who had charge of the funeral, many of them attending. Services were conducted at his late home by Rev. A. P. Neel. Mr. Eagle was a native of Pendleton County, and was 49 years, 8 months old. He married Miss Annie E. Burkhiser, who with two sons, Olin and James, survive. He leaves three brothers, George of New Creek and two in the west, and one sister, Mrs. Taylor Delay, of Petersburg. In memory of our departed friend, D. W. Eagle, who was so suddenly taken from his family on October 15. Words fail to express our sympathy for his devoted and heart broken wife and boys, who loved him so much. Our hearts ache for them. Never was so sad an occurrence in our neighborhood before. We feel the loss of a noble Christian man and are grieved to give him up. We can't understand why so useful a man should have been removed from our midst. He was always ready to help those in need. I can say the best man on Newcreek is gone. Mr. Eagle was born on Upper Tract, Pendleton County, and came to this county when quite a young man and by his honesty and industry has accumulated considerable property and won a warm place in the hearts of his fellowmen. He gave his heart to God when a boy and joined the M. E. Church, South, in Upper Tract and for about twenty-eight years has been consistent member of Rees Chapel, at New Creek; always faithful in discharging his duty. Mr. Eagle married Miss Annie Burkhiser nineteen years ago, and to this happy union was given two good boys, which, with their mother, survive and deeply mourn the loss of a kind husband and loving father, for such he was. His place can never be filled in the home or with his friends. To know Mr. Eagle was to love him. His death has cast a gloom over this community which will long remain. God said to him, "Thy work on earth is done, enter thou into the joys laid up above for thee, where there is no more pain or weeping. God will wipe away all tears from every eye." Funeral service was conducted at his late home at 2:30 by his pastor, Rev. A. A. P. Neel. May the god who kept him and brought him safely through, keep his devoted wife and sons and comfort them and bring at last to make an undivided home above around the Father's throne in Heaven. “Granny” Eagle, believed to be the oldest woman in the country, died Friday near Frostburg, aged 125 years. Four generations of the Eagle family attended the funeral Saturday. Her husband, who is 90 years old and 13 children survive. Mr. William Eagle, son of Mr. G.W. Eagle, who resides at Keyser, but runs a meat market in Westernport, died in Cumberland June 2, 1903 of spinal meningitis. The young man has been attending Mountain State Business College and would have graduated this week. He was 21 years of age. The remains were taken to Martinsburg on Wednesday. Interment was in Green Hill Cemetery. Elkhart - Friends of Donald L. Eairleywine, 83, of Americana Health Care Center, may call at the Walley-Mills-Zimmerman Funeral Home, where the funeral service will be at 11 a.m. Monday. The Rev. Jack Rhoades Jr. will officiate. Burial will be in Rice Cemetery. Mr. Eairleywine died at 2:11 a.m. Thursday (Jan. 7, 1993) at the health care center. He was born June 19, 1909 in Elkhart. He married Margaret Frances Morton Nov. 3, 1934, in Elkhart. She died May 30, 1971, in Elkhart. Surviving are a stepson, John F. Morton of Churchville, N.Y.; five grandchildren, seven great-grandchildren; one brother, Robert V., of Watersmeet, Mich.; and two sisters, Mrs. D.O. (Arlene) Wasson, of Butler, and Mrs. Richard (Velma) Leist, of Elkhart. Mr. Eairleywine, a U.S. Army veteran of World War II, was a retired truck driver and also had worked at Palmer Hardware. Walter Eairleywine of 916 Grant street, aged 35 years, died in the Elkhart General hospital at 8:30 o'clock last night. Death was caused by appendicities whith which Mr. Eairleywine was attacked a week ago yesterday. He grew worse rapidly and on Thursday was taken to the hospital for an emergency operation. However, his condition remained critical and his death was not unexpected. Mr. Eairleywine, who was a son of Daniel and Anna Eairleywine, was born in South Whitley, Ind. on August 20, 1886. Fifteen years ago he came to Elkhart and entered the employ of C. G. Conn, Ltd., with which company he always remained. On July 11, 1903/5? ?, he was married to Miss Ertha Rowley, daughter of Mr. and Mrs. Warren Rowley of 836 Grant street who survives him. Other survivors are the following children: Donald, aged 12 years, Arlene, aged five, and Velma, aged 23 months, and a son born seven days ago; his parents, at South Whitley and a brother, Charles Eairleywine of Cody, Neb. Mr. Eairleywine was a member of Court Elkhart of the Independent Order of Foresters. The funeral of Mrs. Mary E. Earhart, 34, of Genoa, RD 5, Massillon, who died Wednesday night in Aultman hospital at Canton after an illness of six weeks, will be held Saturday at 1:30 p. m. at the Formet & Clevenger funeral home in Canton. The Rev. Earl Hammond and the Rev. Arthur Harsh will officiate. Interment will be made in Northlawn cemetery. Her husband, Robert H. Earhart; three sons, Walden, Randall and Jon Lee, at home; her mother, Mrs. Elizabeth Barkley of Genoa; and a brother, Walden Kroll of Genoa, survive. Mrs. Earhart was a member of Trinity Methodist church at Genoa and was a charter member of the Dramatic Arts club. The body is at the funeral home where friends may call this afternoon and evening. CHARLESTON WV, Nov 3 - Mrs Virginia Chew Earle, wife of Robert Earle, a well known farmer residing near Charlestown, died Fri night from the result of being attacked by a stray sheep on Tues. Mrs Earle left her home to go to the mail box on the public road, and discovering a stray sheep on the lawn, attempted to drive it out. The sheep turned on her, butted her down and continued to do so until she was unconscious, striking her head each time. Mrs Earle was found about fifteen minutes afterwards by her husband, who had gone to the house to warn her about the sheep. The deceased was sixty-seven years old and before her marriage was Miss Chew, sister of Col R P Chew, who survives her, together with another brother, J Aldridge Chew, and a sister, Mrs O Norris. SOMERSET, Aug. 23 — Traffic accidents claimed three Somerset county persons over the weekend. Two Meyersdale men were burned to death when the truck in which they were riding crashed into another truck near Doswell, Va., on U. S. Route 1. They were identified as James W. Marteny, 44, and Harry C. Early, 31, employees of the Walker Milk Transportation Company. The bodies were burned beyond recognition. The son of Elias and Olive Fike Marteny, James W. Marteny also leaves one sister and two brothers, Mrs. Emmett Gnagey of Uniontown, and Simon of Meyersdale and Carl of Akron, Ohio. Mr. Early, the son of Harry Early and the late Minnie Nicholson Early, leaves his father, his widow, Mrs. Mary Yutzy Early, of Meyersdale, and three daughters, Nancy, Eilene and Arlene. Services for Paul W. Early, 43, of Brandonville, WV, who died instantly Saturday night in a motorcycle accident, will be conducted Wednesday at 1 p.m. in the Shady Grove Brethren Church. Mr. Early was traveling on WV Route 73, four miles west of Bruceton Mills, at 8:15 p.m. when he failed to negotiate a curve and overturned after hitting an embankment. A bricklayer by trade, he was a native of Preston County, a son of Mrs. Ida May (Teets) Early and the late Vernon L. Early. Surviving are his widow, three children, Kenneth, Linda, and Robert Early, all at home; and a sister, Mrs. John Keefer. The body is at the Harned Memorial Funeral Home in Brandonville. Winchester, Va, - Gilbert C, Earnhardt, 28 years old, formerly of Mt, Jacksonm Va,, while in the act of throwing coal from a Baltimore and Ohio railroad train today for fuel for his poverty stricken family fell and was cut in twain, eleven cars passing over his body, killing him instantly. Several months ago he was injured when part of a woolen mill was fell upon him. His wife and three young children were standing nearby and witnessed todays tragedy. Mrs. Lottie V. Earnest, 74, of 500 Eastern Avenue, died today in Sacred Heart Hospital where she was a patient three days. Born in Southhampton Township, Pa., she was a daughter of the late Lewis and Anna (Willison) Emerick. Mrs. Earnest had been in failing health several years. Surviving are a daughter, Mrs. Wilbur F. Combs, with whom she resided; a son, Albert E. Earnest Jr., Washington; two brothers, Thomas E. Emerick, Youngstown, and Alvin A. Emerick, Boswell, Pa.; three sisters, Mrs. William Sturtz, Parma, Ohio; Mrs. Ben Maust, Somerset, and Mrs. Elwood L. Miller, Johnstown, Pa.; five grandchildren and seven great-grandchildren. The body is at the Kight Funeral Home where the family will receive friends from 7 to 9 p.m. today and 2 to 4 and 7 to 9 p.m. tomorrow. Services will be conducted at the funeral home Wednesday at 1 p.m. by Rev. Jacob H. Snyder, and interment will be in Comps Cemetery, Comps Corner, Pa.
John William Earsom, 83, formerly of 39 Mary Street, died last night in the Allegany County Infirmary. He had been in ill health three months. A native of Springfield, W.Va., he was born December 27, 1874, a son of the late William F. and Mary Jane (Neff) Earsom. His wife, Mrs. Minnie F. Dowden Earsom, preceded him in death. He was a retired laborer for the N & G Tin Plate Mill. Mr. Earsom resided with his daughter, Mrs. Ruth Sisk, of 39 Mary Street. Besides his daughter, he is survived by four other daughters, Mrs. Catherine Herboldsheimer, Mrs. R. H. Brinkman, Mrs. William R. Robertson, and Mrs. B. A. Cross, all of this city; a sister, Mrs. Mary Lear, this city; 14 grandchildren and 10 great-grandchildren. The body is at the Scarpelli Funeral Home. Interment will be in Fort Ashby Cemetery. The burial of Mrs. Clara Eastburn, wife of Samuel E. Eastbnrn, former residents of this city, who died at her home in Baltimore, Tuesday, took place in Rose Hill Cemetery this afternoon. Rev. Dr. James Moffatt, pastor of First Presbyterian Church officiated. The pallbearers were: Dr. H V Deming, Charles K. Dailey. Perry Warfield, Matthew J. Mullaney, J. Frank Eyman and William E. McDonald. Mrs Eastburn was a sister of Dr George L Carder, this city. Mrs. Ira M. Easton, 34, wife of Ira M. Easton, Braddock Farms, LaVale, died yesterday afternoon at her home. She had been in failing health a number of years. 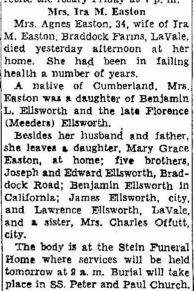 A native of Cumberland, Mrs. Easton was a daughter of Benjamin L. Ellsworth and the late Florence (Meeders) Ellsworth. Besides her husband and father, she leaves a daughter, Mary Grace Easton, at home; five brothers, Joseph and Edward Ellsworth, Braddock Road; Benjamin Ellsworth in California; James Ellsworth, city, and Lawrence Ellsworth, LaVale, and a sister, Mrs. Charles Offutt, city. The body is at the Stein Funeral Home where services will be held tomorrow at 9 a.m. Burial will take place in SS. Peter and Paul Church. Ida E. Ebaugh, 94, died Monday at Meyersdale Community Hospital. Born in New Germany, Md., she was a daughter of the late Isaac and Maria (Durst) Spiker, and was the widow of Joseph W. Ebaugh, who died in 1936. Surviving are two sons, Clarence and Raymond Ebaugh, here; a brother, Gurney Spiker, RD, Salisbury. The body is at the Leckemby-Price Funeral Home, where friends will be received after 2 p.m. today, and where the rosary will be recited at 8:30 p.m. Mass of the Christian Burial will be celebrated tomorrow at 10 a.m. at SS. Philip and James Catholic Church. Burial will follow in the church cemetery. Meyersdale, Pa., Jan. 25 - Joseph W. Ebaugh, aged 65, died at his home on Broadway, Thursday, following an illness of several days of pneumonia. Funeral services will be held Monday at 9 a.m. with requiem mass in SS Philip and James Church. His pastor, Rev. H. T. Miller will officiate. Interment will be in the church cemetery. Mr. Ebaugh is survived by his widow and two sons, Clarence and Ray Ebaugh; three grandchildren, and two sisters and one brother, Mrs. Sampson McKenzie and Miss Agnes Ebaugh, Meyersdale, and Simon Ebaugh, Boswell, Pa.
MEYERSDALE — Miss Mary Agnes Ebaugh, 86, died Saturday night. A native of Somerset County, she was a daughter of the late Reinhold and Victoria (Hammer) Ebaugh. She is survived by a number of nieces and nephews. A requiem mass will be celebrated tomorrow at 9 a m. at SS Philip and James Catholic Church. Burial will be in the parish cemetery. The body is at the Price Funeral Home. Matthias Everline, Mrs. Melchior J. Miller's father, died on the 12th of dropsy, 73 years of age. George Stark and Margaret Dietrick are both very ill with dropsy. A telegram was received yesterday afternoon announcing the death of Miss Martha Eberly, who underwent an operation in the Western Md Hospital in Cumberland Mon. She revived from the operation and was doing nicely until yesterday, when she suddenly grew worse and died about noon. The remains will be brought here today and burial made at this place. Mrs. Lydia Ebert, aged 69 years, died Sunday evening May 19th, at the home of her son, Jesse Ebert, near Sherr in Grant County. Surviving are one sister, Mrs. Simon P. Idleman and five sons W. F. Ebert of Laurel Dale; Jesse Ebert of Scherr; T. U. Ebert of Blaine; J. T. Ebert of Norristown, Pa., and Wilbur G. Ebert of Dodson, Md. Her husband, Jno L. Ebert, died in 1881. The funeral was preached by Rev. Ben Smith and interment was made in the family cemetery. SCOTTDALE, Apr. 29 - Mrs. Eliza E. Echard, 64 years old, wife of Simon S. Echard, died Thursday evening at her home in Kingsview. She had been ill for-six months. Mrs. Echard had been a resident of the community for 38 years. She was a member of the Church of God at Alverton. Besides her husband there survive six daughters and five sons - William, Mrs. Georgia DeWalt, Mrs. Frank Miller, Jacob W., Oliver H. and Mrs. Roy Myers, Jr., of Scottdale; Mrs. Charles Rutherford and Mrs. Chester Moorehead of Urichsville, Ohio, Mrs. John Crosby of Mount Pleasant, James R. and Albert E. at home; 22 grandchildren, one great-grandchild; a brother, Emery Thompson of Scottdale and a sister, Mrs. Smith Hunker of Pleasant Unity. The funeral service will take place at 2:30 o'clock Sunday afternoon at the Church of God at Alverton, with Rev. Arthur E. Eakin, pastor, officiating. Burial will be in Alverton Cemetery. Albert J. Eckard, 58, of Bedford Valley, Pa., died today in Memorial Hospital, where he had been admitted March 30. Born in Hendricks, W. Va., he was a son of the late Daniel B. and Lillie D. (Hawkins) Eckard. He was a retired employe of the Celanese Fibers Company and a member of the Bethel United Methodist Church. Surviving are his widow, Mary V. (Bobo) Eckard; two daughters, Mrs. Amelia League, Westernport, and Mrs. Dixie Arnold, Centerville, Pa.; five sons, Robert E. Eckard, Frostburg; Albert F. Eckard, at home; Bruce D. Eckard, Cumberland; John R. Eckard, Bedford, Pa.; and James E. Eckard, Centerville, Pa. Also, three sisters, Mrs. Bessie Weigand, LaVale; Mrs. Pearl Lewis, Cumberland, and Mrs. Marie Wentz, Phillipi, W. Va.; a brother, Oliver Eckard, Conway, S. C.; 21 grandchildren and five great-grandchildren. The body is at the Durst Funeral Home where friends will be received today from 7 to 9 p.m. and tomorrow from 2 to 4 and 7 to 9 p.m. Services will be conducted in the funeral home Monday at 1:30 p.m. by Rev. Fred C. Hickock, pastor of the Bethel United Methodist Church. Interment will be in Sunset Memorial Park. Daniel Eckard, 61, Hendricks, W. Va., died this morning at Allegany Hospital, where he was admitted September 30. He was a former Western Maryland Railway employe. Surviving are his wife, Mrs. Lillie (Hawkins) Eckard; four sons, Albert, Robert, Jack and Oliver Eckard, this city; four daughters, Mrs. Daisy Jones, and Mrs. Pearl Dawson, Ridgeley; Mrs. Rose Graham, Philippi, W. Va., and Mrs. Bessie Wiegand, this city. George M. Eckard, 59, of 18 Mineral Street, Ridgeley, died yesterday in Memorial Hospital where he had been a patient since March 26. Born in Hendricks, W.Va., he was a son of Mrs. Leila (Roberts) Dennison, Short Gap, and Samuel Eckard Sr., Keyser. Mr. Eckard was employed as an advertising clerk at The Kelly Springfield Tire Company and was a member of United Rubber Workers Local 26. Surviving are his widow, Mrs. Vera A. (Breedlove) Eckard; two daughters, Mrs. Sondra Skidmore, Ridgeley; Mrs. Carol Flanagan, Millerdale, Ridgeley; two sons, Ronald M. Eckard, Martinsburg, W.Va.; Donald M. Eckard, Short Gap; a sister, Mrs. Joyce Squires, Salisbury, Md. ; three brothers, Robert Eckard, Columbia, S.C.; Luke Eckard, Canton, Ohio; Garland "Jim" Eckard, Erie, Pa., and nine grandchildren. Friends will be received at the George Funeral Home, with interment in Fort Ashby Cemetery. Jack Elmer Eckard, 62, of 708 White Avenue, died at his home yesterday. He had been in failing health. Born in Hendricks, W. Va., he was the son of the late Daniel and Lilly (Johnson) Eckard. Surviving are his widow, Ruth (Kelso) Eckard; three sons, Jack E. Eckard and William Eckard, both at home, and James D. Eckard, city; three brothers, Albert Eckard, Centerville, Pa.; Oliver Eckard, Charlotte, S. C.; Robert Eckard, city; four sisters, Mrs. Rose Graham, Ridgeley; Mrs. Marie Wentz, Phillipi, W. Va.; Mrs. Bessie Wiegand, LaVale, and Mrs. Pearl Lewis, Hanover, Pa., and one grandchild. The body is at the Scarpelli Funeral Home where friends will be received from 2 to 4 and 7 to 9 p. m. Services will be conducted tomorrow at 1 p. m. at the funeral home by Rev. John S. Park, pastor of Kingsley Methodist Church. Burial will be in Sunset Memorial Park. Mrs. Lillie Dale Eckard, 81, died yesterday at the home of a daughter, Mrs. Rose Graham, 22 Perry Street, Ridgeley. She had been in failing health 15 years. She was born in Marion County, West Virginia, June 28, 1880, a daughter of the late Daniel and Cynthia (Sapp) Hawkins. Her husband, Daniel B. Eckard, preceded her in death. She was a member of Calvary Methodist Church. Surviving, besides Mrs. Graham, are four sons, Albert J. Eckard, Centreville, Pa.; Jack and Robert Eckard, city; and Oliver B. Eckard with the Air Force in Columbus, Ohio; four other daughters, Mrs. Daisy Jones, Cumberland; Mrs. Bessie Wiegand, LaVale; Mrs. Pearl Dawson, city; and Mrs. Marie Wentz, Phillippi, W. Va.; 23 grandchildren and 24 great-grandchildren. The body is at the George Funeral Home. Services will be conducted Saturday at 10 a. m. at the funeral home by Rev. B. F. Hartley, pastor of Calvary Church, and interment will be in Sunset Memorial Park. returned to the George Funeral Home. Mrs. Ruth E. Eckard, 75, of 708 White Avenue, died yesterday at her home. A native of Grahamtown, she was a daughter of Alex and Mary (Meagher) Kelso. She was preceded in death by her husband, Jack E. Eckard. Surviving are three sons, Jack E. Eckard, Jr., at home; James D. Eckard and William H. Eckard, both of this city; a sister, Mrs. Edith Brehany, Ridgeley, and two grandchildren. Friends will be received at the Scarpelli Funeral Home from 7 to 9 today and tomorrow from 2 to 4 and 7 to 9 p.m. Services will be conducted at the funeral home at 10 a.m. Monday by the Rev. John Kuschel. Interment will be in Sunset Memorial Park. FORT ASHBY, W.Va. - Samuel K. Eckard, 91, of the Dawn View Manor Nursing Home, died Thursday, April 13, 1989, at Sacred Heart Hospital, Cumberland, Md. Born March 5, 1898, in Tucker County, he was the son of the late George and Sarah (Wolford) Eckard. Mr. Eckard had worked as a fireman on the Western Maryland Railway. He was a member of the Old Furnace Church of the Brethren. Survivors include two sons, Robert Eckard, RD 2, Keyser, and James Eckard, Dunnellon, Fla.; one daughter, Joyce Squires, Salisbury, Md. ; 28 grandchildren, 14 great-grandchildren, and four great-great-grandchildren. Friends will be received at the Fort Ashby Funeral Home. RIDGELEY, W.Va. — Vera Alma (Breedlove) Eckard, 81, of Ridgeley, died Saturday, Aug. 14, 1999 at her residence. Born July 12, 1918, in Los Angeles, Calif., she was the daughter of the late Clyde W. and Aretta (Cosner) Breedlove. She also was preceded in death by her husband, George Eckard in 1977. Mrs. Eckard was a member of the Ladies Auxiliary, Gold Star Post 6452, Ridgeley, where she served as chaplain for over 25 years. Survivors include two sons, Ronald Eckard, NC, and Donald Eckard, Short Gap; two daughters, Sandi Blubaugh, LaVale, Md., and Carol Garlitz, Frostburg, Md. ; one sister, Pearl Ross, New Cumberland, Ohio; a half-sister, Reva Thomas, Oakland, Md. ; two half-brothers, Arlie Breedlove, Accident, Md., and Larry Breedlove, Shardon, Ohio; ten grandchildren and ten great-grandchildren. Friends will be received at the Upchurch Funeral Home, Cumberland, where the funeral service will be held with the Rev. Ed Dickel officiating. Serving as pall bearers are William Skidmore, Chris Eckard, Travis Blubaugh, William Benson, Sam Allison and John Garlitz. Interment will be in Fort Ashby Cemetery. William E. Eckhart, 78, of 81 East Main Street, Frostburg, died yesterday in Frostburg Community Hospital. A native of Eckhart, he was a son of the late John Thomas Eckhart and Rachel (Pengelly) Eckhart. He was a retired coal operator and accountant. Mr. Eckhart was a member of Akron (Ohio) Lodge 83, AF & AM: Ali Ghan Shrine Temple, Cumberland Consistory of Scottish Rite, was a former officer of the Frostburg Lions Club and a former member of the Frostburg Rotary Club. He is survived by his widow, Mrs. Elizabeth May (Logsdon) Eckhart; a daughter, Mrs. Margaret V. Faulk, Fairfax, Va.; a brother, Charles F. Eckhart, of Eckhart, and three sisters, Mrs. Perry Dudley, Eckhart; Mrs. William Rephan, Frostburg, and Mrs. J. Edgar MacMannis, LaVale. The body is at the Hafer Frost Mansion Funeral Home where friends will be received today from 2 to 4 and 7 to 9 p.m. Mountain Lodge, AF & AM, will conduct a memorial service at the funeral home today at 7:30 p.m. A funeral service will be conducted tomorrow at 2"30 p.m. with Rev. Richard J. Brown, pastor of St. John's Episcopal Church, Frostburg, officiating. Interment wil be in Eckhart Cemetery. Sept. 28, 1973, Cumberland News. Peter Eckis, Williamsport, died at the Washington County hospital at a 5 o'clock yesterday morning from paralysis, aged 59 years. Mr. Eckis was a W. M. freight flagman and was stricken while assisting to make up his train in Hagerstown Tuesday evening. When found he was unconscious. He was removed to the hospital and never regained consciousness. He was a native of Williamsport and for a number of years was a boatman. For the past 15 years he had been employed by the W. Md. R.R. He was a member of the M. E. church, the Knights of Pythias, Odd Fellows. Jr. O. U. A. M. and the Relief Association. He married Miss Rebecca Bowser, Williamsport, a sister of Mrs. J. W. Dodd, of this c1ty. He is survived by a widow and four children. Frank Joseph Edenhart, 78, died yesterday morning at his home on Dan's Run, near Fort Ashby. He had been in ill health for the past year. He was born in Ridgeley, a son of the late Mr. and Mrs. Michael F. Edenhart, and was employed by the West Virginia State Road Commission at the local district office. Surviving are two daughters, Mrs. Violet Williams, Wheeling, and Mrs. Emily Smith, Cumberland; five sons, Clarence, Leon and John, Pittsburgh; Michael, Ridgeley; and George, Lakeland, Fla. Fourteen grandchildren and seven great-grandchildren also survive. Services will be held tomorrow in the Methodist Church at Fort Ashby, with Rev. A. L. Harman, pastor, officiating. Burial will be in the Fort Ashby cemetery. The body is at the Rogers Funeral Home, Keyser. John E Edenhart, 45 years of age, died at his home in Ridgeley, W Va, night at 8:30 o'clock after a brief illness. He is survived by two son, Boyd and Charles and five daughters, Gertrude, Annalee, Clarabelle, Dorothy and Mary. Mr Edenhart conducted a soft drink establishment at 21 Johnson Avenue for a number of years. The following brothers and sisters also survive: Charles Edenhart, Frank Edenhart, Mrs Ida Rhoden, all of Ridgeley; Mrs A L Manlove, Cumberland and Mrs Estella Lippencott, Philadelphia. CUMBERLAND - Nellie W. Edenhart, of Cumberland, died Wednesday, Oct. 17, 2007 at The Lions Center. Born in Midland, she was the daughter of the late John T. and Bridget (Byrne) White. She was also preceded in death by her husband, Charles E. Edenhart, in 1977. Mrs. Edenhart had been a sales clerk at Kaplan's Men's Store and Montgomery Ward. She was a member of St. Patrick's Catholic Church and the Cumberland Senior Citizens. Survivors include her daughter, Ellen Kathryn "Kay" Robinson, Longview, Wash.; her sister, Catherine Powell, Cumberland; and two grandchildren, Scott Robinson, West Palm Beach, Fla. and Nicole McOmie, Vancouver, Wash. Friends will be received a the Upchurch Funeral Home, PA., 202 Greene St., Cumberland, on Saturday from 10 to 11 a.m. The funeral service will follow at 11 a.m. at the funeral home. Interment will be in St. Mary's Cemetery. Allen Clark Edgar, 66, of Grantsville, Md., died Wednesday, August 25, 2004, at his home after having fought a courageous battle with cancer. Born December 28, 1937, at Grantsville, he was the son of the late William Donald and Dora Elizabeth (Kahl) Edgar. He was preceded in death by two sisters: Iretha Brenneman and Margaret Yoder; three brothers: Elwood, Stanley and Olen Edgar. Mr. Edgar was a US Army veteran serving during the Vietnam War. He worked in the maintenance department at Sheetz, Meyersdale, and was a member of St. Ann's Catholic Church, Grantsville. Surviving is his loving and dedicated wife of 39 years, Mary A. (Garlitz) Edgar; two daughters: Berenice M. and husband Ronald A. Shaffer, Finzel, Md. ; Laura A. and husband Mark W. Nicol, Grantsville, Md. ; three brothers: George Edgar, Salisbury; Otis Edgar, Baltimore, Md. ; Dennis Edgar, Elizabethtown, Kentucky; two sisters: Edith Yoder and Dorothy Lowery, both of Meyersdale; two granddaughters: LaTisha and Danielle; loving and caring nurse, his niece, Linda Lottig and four dedicated friends: Sister Joan Minella, Lillie Walker, Theresa Martha and John Jastrzembski. Friends were received Friday at the Newman Funeral Homes, P.A., Grantsville. Mass of Christian Burial was held at 10 a.m. Saturday, August 28, at St. Ann's Catholic Church, with the Rev. Doug Kenney officiating. Interment was in the Grantsville Cemetery. Military rites were accorded. Pallbearers were: John Jastrzembski, Ronald Shaffer, Lenny Lottig, Johnny DiFebo, Joe Edgar, Brandon Edgar and Ryan Edgar. Expressions of sympathy may be directed to Hospice of Garrett County. Mrs. Cora A. Bird Edgar, widow of Thomas Edgar, died last Friday, Feb. 20, 1942, at her home in Confluence after an illness of several months from complications. She was preceded in death by her husband and an infant child. Mrs. Edgar had at one time been a member of the Confluence council and for many years was secretary-treasurer of the First Methodist Church, of which she was an active member. Mrs. Mary Edgell, mother of Dr. L. L. Edgell, died at her home in Ritchie county W. Va., September 1, after a lingering illness. Mrs. L. L. Edgell had been with her most of the summer and Dr. Edgell was with her when the end came. Services were conducted Monday for Mrs. Wanda Lea (Steward) Edinger, 40, a city native, who was killed in an automobile accident, in the Tyson-Wheeler Funeral Home, Rockville. Interment was in Park Avenue Cemetery, Rockville. Mrs. Edinger, a former resident of 127 North Centre Street, was killed instantly Thursday in a headon collision just across the Pennsylvania - Maryland state line. Relatives said that she and her children, 13-year old son Jimmy and daughter Sabrina, 4, were enroute to Stroudsburg, Pa., to visit friends. The children received only minor injuries. A daughter of Mrs. Reba (Brant) Steward Arnone, Rockville, and the late Leslie E. Steward, she is also survived by her aunt, Mrs. Cleo F. Martens, city. Ada Edwards, 87, of Aurora, died Tuesday, May 17, at the Garrett County Memorial Hospital, Oakland. She was born May 4, 1907, at Stemple Ridge, a daughter of the late William and Cyrene (Lantz) Hardesty. She was a member of the Aurora United Methodist Church, the Rebekah Lodge and Union District Senior Citizens. She is survived by five daughters, Naomi Edwards of Sedona, AZ., Eve Edwards of Mtn. Lake Park, Joyce Thomas of Phoenix, AZ, Delores Taylor of Cleveland, OH, and Carolyn Conley of Thousand Oaks, CA; one son, Charles Edwards, Sr. of Martinsburg; one sister, Pauline Wilhelm of Aurora; 14 grandchildren, 16 great-grandchildren and several nieces and nephews. She was preceded in death by her husband, Ralph H. Edwards; a son, Randall, and a daughter, Cheryl. Services were held from the Stemple Ridge United Methodist Church, with the Rev. Charles Teets officiating. Burial was in Stemple Ridge Cemetery. Dana Lee (Danny) Edwards, former Frostburg resident who lived at Darnestown, was killed yesterday near his Montgomery County home. Details were not available from authorities. He was born in Cumberland, a son of Marvin and Helen (Gilmore) Edwards. Mr. Edwards was the Maryland manager for Xerox Corporation. He was a member of St. John's Episcopal Church, here, and was an Army veteran of the Vietnam War. Survivors, in addition to his parents, include his widow, Rosella (Houpe) Edwards; three sisters, Mrs. Lynda McKelvie, Colorado Springs, Colo.; Miss Bonnie Edwards, Annandale, Va.; and Miss Cecelia Edwards, Baltimore, and one brother, Brian Edwards, at home. The body will be returned to the Sowers Funeral Home, where friends will be received from 2 to 4 and 7 to 9 p.m. tomorrow and Monday. HYNDMAN, Pa. - Helen Elizabeth Edwards, 81, of Hyndman, formerly of Ellerslie, Md., died Wednesday, July 23, 1997, at Sacred Heart Hospital, Cumberland. Born September 10, 1915, in Frostburg, she was a daughter of the late William H. and Barbara (College) Wilkins. She also was preceded in death by her husband, Robert J. Edwards, on October 17, 1989. Surviving are two sons, Dale L. Crabtree and wife Doris, Corriganville, and Roger H. Edwards and wife Deborah, Atwater, Ohio; two daughters, Shirley A. Smith and husband Lee, R.D. 1, Buffalo Mills, and Brenda L. Smith and husband Joseph, Union City; nine grandchildren; nine great-grandchildren; and a sister, Margurite Osborn, Jonesborough, Tenn. Mrs. Edwards was a homemaker and had attended the Bible Gospel Church, Hyndman. Friends will be received at the Harvey H. Zeigler Funeral Home, Hyndman, on Thursday from 2 to 4 and 7 to 9 p.m. Services will be conducted at the funeral home on Friday at 11 a.m. with the Rev. Fay E. Leydig and the Rev. Danny W. Newman officiating. Interment will be in Lybarger Cemetery. Grandsons Dale E. Crabtree, Roger J. Edwards, Jason R. Smith, Brian L. Smith, Thomas W. Logsdon, Bobby C. Deneen, G. Vernon Ringer, and Mike F. Bennett will serve as pallbearers. "MRS. J. REX EDWARDS-LONACONING - Mrs. Isabel B. Edwards, 78, Midland, died Tuesday at Frostburg Community Hospital. Born in Midland, she was a daughter of the late William F. and Isabel H. (Thompson) Broderick. Her husband, J. Rex Edwards, preceded her in death. Mrs. Edwards was a member of St. Joseph's Catholic Church, Midland, and of the Sodality. She worked with the USO in Pittsburgh. Surviving are one daughter, Mrs. Mary Elizabeth Gleeson, Pittsburgh; one son, John Rex Edwards, Atlanta, Ga.; two sisters, Mrs. Mary Baker and Miss Catherine Broderick, both of Midland; one brother, William Broderick, Lonaconing, and 10 grandchildren. The body is at the Eichhorn Funeral Home. Mass of the Resurrection will be celebrated today at 11 a. m. at St. Joseph's Church. Interment will be in St. Michael's Cemetery, Frostburg. The family requests that expressions of sympathy take the form of contributions to a favorite charity." ELK GARDEN - Mr and Mrs John Bankert and little daughter Katie, attended the funeral of John O Edwards, near Tunnelton, last week He was 67 years of age and the father of Mrs Rankert. Kate Edwards (colored) was found in a stupor lying on the floor of her home late Monday afternoon. She died soon after being found. It is thought that she had been lying on the floor since early morning as she was dressing only in her sleeping clothes. She lived alone in a house on the rear of the lot of Mrs. C. M. Maddocks who went to the house to investigate after not having seen anyone on the premises all day. A physician was called but he could do nothing to revive the woman. Friends took charge of the remains and the funeral was held at the colored church Wednesday afternoon. The deceased was one of the oldest citizens of Davis. A coincidence in her death was the death also of her lover, Holman Boatright, of Thomas, who died the same day and in the same manner. Spouse: James H. Edwards, Sr.
Robert J. Edwards, 76, of Hyndman, formerly of Ellerslie, Md., died Tuesday, Oct. 17, 1989, in Sacred Heart Hospital, Cumberland, Md. He was born May 11, 1913, in Huntingdon, a son of the late John H. and Hazel (Harris) Edwards. He also was preceded in death by his stepfather, Howard Brant, and one brother. He is survived by his wife, Helen E. (Wilkins) Edwards; two sons, Dale L. Crabtree of Ellerslie, Md., and Roger H. Edwards of Atwater, Ohio; and two daughters, Mrs. Shirley A. Smith, Buffalo Mills RD 1, and Mrs. Brenda L. Smith, Union City; nine grandchildren and two great-grandchildren. Also surviving are two brothers, Walter and Donald Brant, and two sisters, Mrs. Josephine Logsdon and Mrs. Marjorie Ritchey, all of Ellerslie, Md. Mr. Edwards was a retired employee of the Kelly Springfield Tire Co. of Cumberland, Md. Funeral services: Thursday, Oct. 19, at 2 p.m. in the Harvey H. Zeigler Funeral Home, Hyndman, with Rev. D. Lloyd Abbott officiating. Burial in Lybarger Cemetery at Madley. RIDGELEY, W.Va. - Rose Catherine Edwards, 80, of RD 2, Box 108, died Wednesday, Sept. 25, 1991 at Memorial Hospital, Cumberland, Md. Born July 19, 1911 in Berlin, Pa., she was the daughter of the late Calvin and Ella (Mishler) Cook. Three brothers and one sister also preceded her in death. Mrs. Edwards was a homemaker. She was a member of Graceland Baptist Church, Short Gap, and the Ladies Bible Class of the church. Survivors include her husband, Richard H. Edwards; one son, Richard E. Edwards, Ridgeley; a daughter, Mary Lou Raley, Miltenberger Road; three brothers, Homer Cook and John B. Cook, both of Glencoe, Pa.; and Bunn Cook, Berkeley Mills, Pa.; two sisters, Betty Smith, Berlin; and Ida Owens, Cumberland; seven grandchildren; and 16 great-grandchildren. Friends will be received at the Scarpelli Funeral Home, Virginia Avenue, Cumberland. Services will be conducted there Saturday at 1 p.m. by the Rev. Frank Hyder. Interment will be in Hillcrest Burial Park, Cumberland. Bernard Edward Egan, 51. former resident, died early Sunday morning at Mercy Hospital, Pittsburgh. He suffered a sudden attack at his home, and death followed soon after reaching the hospital. Mr. Egan was a son of Mrs. Mary E. Egan, 111 Greene street, who is ill, and the late John S. Egan. He left Cumberland twenty-one years ago, first going to McKeesport. He was a steelworker. Besides his mother, he is survived by his widow, the former Margaret Donahue, and an adopted son, Thomas Egan. He was a brother of Mrs. Margaret Beier, wife of William G. Beier, and Mrs. Alice Yeager, wife of Bernard G. Yeager, this city, and Mrs. Mary Dawson Johnson, Chevy Chase, Md., who arrived at the Egan home here Sunday afternoon. Mr. and Mrs. Beier and niece, Miss Agnes Rohman attended the funeral, held from St. Agnes Catholic Church, Pittsburgh, this morning. Mrs Margaret Egan died in Pittsburgh at the home of her daughter, Mrs John Ward. The body will arrive from Pittsburgh on Baltimore & Ohio train No 6 on Tuesday and will be taken to Frostburg for burial. Services will be held at St Michael's Catholic church Tuesday at 2 p.m. Mrs Egan was a sister of the late Rev M J Brennan and Mrs Ellen Logsdon, Mt Savage. William Michael Egan, 81, of 212 Arch Street, died Sunday at Memorial Hospital. He is survived by his widow, Mrs. Anna Egan; two daughters, Nora Collett, Fort Ashby, W.Va., and Elaine Muller, Springfield, W.Va.; and six grandchildren. Mr. Egan’s body will be donated to West Virginia University for medical research. Mr. Henry Eggers, a prominent citizen of Oakland, died there yesterday. Mr. Eggers was about seventy years of age, and has been suffering with the grip for about a month. He leaves a wife and several grown children.